This card already has a connector internally, but from what I read elsewhere it is only meant for bench test purposes. I wanted something more sturdy and useful, so I decided to solder on an RP-SMA connector with a very short length of coax attached. This connector came from cutting in half a RP-SMA to RP-TNC adapter that came along with a little antenna that I bought. Any small diameter coax with your choice of connector could be used. For larger connectors, a longer coax that extends out of the card's housing might be the best idea. First, I removed the case of the card. This was done by prying (I used my fingers) the edges of the bottom cover down away from the top cover. The bottom cover is held on by double stick tape at the connector end of the card, and I just pulled on this gently until it came loose. The other end has a tab that extends under the plastic cover. Once the bottom metal cover was removed, the bottom plastic cover could be popped out by just tugging on it. The circuit board is held in to the top cover only by some tabs at the connector end. I carefully snapped that out and was ready to get to work. Here's what the antenna end of the card looked like before. I decided to remove the ufl connector and the smt cap that connects the antenna. I also scraped off the trace that connected the center of the connector to the smt cap. It seemed like it might contact the shield of the coax that I would be soldering there, so I got rid of it. Here's what it looked like with all the stuff removed and ready to solder the coax. Soldering the coax on was tricky. The pads are small and my short coax with connector can put a lot of strain on them. I made the mistake of wiggling the connector to see if I had a good solder joint and pulled up the pads. A little superglue got that fixed up and I resoldered. It doesn't look the best, but I think it's good enough. Here's the card with coax and connector attached. Last, I glued it all down to limit stress on the pads. While this was drying, I cut a notch into the plastic to accomodate the new connector. Once dry, I reassembled it and epoxied the connector to the case to keep it from moving around (and damaging the pcb). It might have been a mistake to not have 6" or so of coax so that when I want to hook up the LMR400 it isn't stressing the card, but oh well, I may have to do this again. I like the idea of the fixed connector because I can put a little whip antenna on there and it's self supporting. Here are the pictures of the final product. Took the card out and tested it on the 21 mi path to the hill. 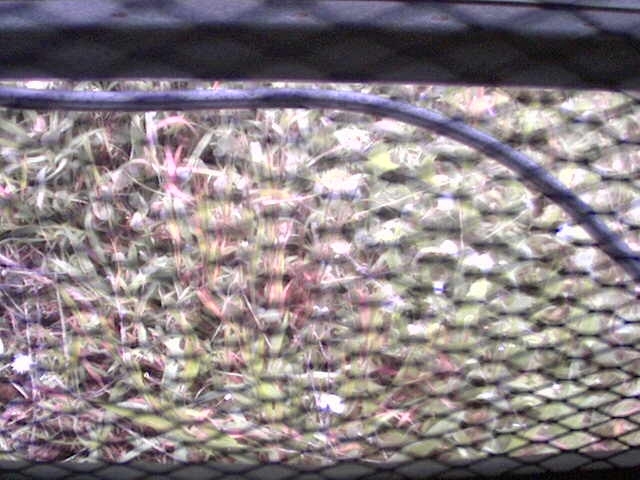 Got a nice picture back from the camera up there showing that the Roundup is working on the weeds. The epoxy seems to hold quite well and with a little care, the LMR400 doesn't seem to stress it too much.